"If you want to make an improvement or an innovation or an invention, the place to look is in yourself," Mike Augspurger told students at the Lemelson Center's Innovative Lives presentation in May 2000. "If you're good at two or three things, and can get those things to mesh, that's where you might be able to contribute and do something that's never been done before." He was speaking from his own experience as an expert cyclist, a skilled machinist, and a designer and builder of bicycles. Augspurger, founder of One-Off Titanium, Inc., is a specialist in custom and unusual titanium frame bicycles, including the first all-terrain handcycle designed for wheelchair athletes. Meeting with students from four schools (the Rosa Parks Middle School in Olney, MD; the Nicholas Orem Middle School in Hyattsville, MD; Jefferson Junior High School in Washington, DC; and Nysmith School in Herndon, VA), Augspurger demonstrated his One-Off All-Terrain Handcycle and described his long interest in cycle riding and design and his experimental use of titanium for bikes and other products. Augspurger was born in 1956 in Fort Wayne, IN, a place he describes as having "good outdoor sports." His mother was a nurse and his father worked in the printing industry, but both were avid go-cart racers. Some of Augspurger's earliest memories are of watching his father take his go-cart engine apart to rebuild it after every race. Another vivid early memory is of sitting between one of his parent's legs, hanging onto the shaft of a go-cart, wearing a helmet that was much too big for him, hearing lots of noise, and being told, "Hang on tight!" His father even built him a child-size go-cart, but never found a motor that was small enough for it. A cyclist travels downhill on Mike Augspurger's handcycle. Photo courtesy of Mike Augspurger. It's not surprising that Augspurger grew up with a talent and enthusiasm for tinkering with machines and riding them—but his interest was in motorcycles and bikes, not go-carts. His first bicycle, which his parents bought in the 1950s, cost 12 dollars. Around 1960, he got a Schwinn: "The only bicycles you could buy [at that time] were American-made, like a Schwinn or a Columbia, which were very high quality, but heavy. The bike would last forever, but it weighed about the same as I did." Racing bikes and mountain bikes were not yet on the market, and aluminum had not yet been used in bicycle manufacture. The heavy weight of his bicycle made Augspurger wish he had motor power. With money from his first job (bagging groceries), Augspurger bought a racing go-cart. It was not long, however, before his interest focused on motorcycles. As soon as he was old enough to drive, he borrowed his parents' van to haul his motorcycle (which he modified to reduce its weight) to competitions. He was not interested in racing, but rather in tests of skill known as "trials," which required maneuvering over "the worst possible terrain—rocks and logs and water crossings and all kinds of hills." Riders accumulated penalty points each time they put a foot on the ground for balance; the winner was the rider with the lowest score at the end of the competition. Augspurger liked the challenge of difficult conditions, and in high school he was known as "the guy who rode his motorcycle to school everyday, no matter what the weather—snow, rain, or anything else." After graduating from high school in 1974, he studied motorcycle mechanics for a year at the Indiana Institute of Technology and took courses at the University of Evansville. He did not see the need for a typical college education, and when asked what his major would be, he did not hesitate to say, "undecided." Mike Augspurger speaks to students during an Innovative Lives presentation at the Lemelson Center in 2002. Smithsonian photo. After returning home and driving a delivery truck for a another year, he set off on his motorcycle for California. He crossed the country and drove up and down the California coast. Ready to work again, he got a job in a machine shop as a buffer, polishing metal. The work was dirty, dangerous, and tiring, but it allowed him eventually to become a machinist's apprentice, providing hands-on training. While apprenticing, Augspurger heard about Hampshire College in Massachusetts, which had an unusual program. "I immediately liked it because it had no grades, no tests, and no required courses." He applied and was accepted. He pursued his "undecided" major by taking courses in philosophy, psychology, and fiction writing. It was the writing that proved to be most important to him: "School's good for some things, especially learning to write. I use it all the time; anyone would. . . I can write letters fast, and they're good. Before, without the liberal arts college, it would have been a real struggle." For a while, Augspurger put his writing skills to work as a columnist for the bicycle magazine Velo News. In 1981, with his B.A. from Hampshire, he took another job in a machine shop, this time as a pattern maker for a company in the Boston area that made casts and molds for engineering and industrial use. Mountain bikes had been introduced only a few years earlier, and Augspurger bought one of the first models available. "I liked the idea of a bicycle that was like the motorcycle I used for trials," he explains, "for negotiating the worst possible terrain." He immediately began modifying and improving his mountain bike and then, still dissatisfied, began building his own frame. Wanting access to the full range of equipment for bicycle production, he changed jobs again, this time working for a bike factory in the Boston area, Fat City Cycles. The owner's name was Chris Chance, and they produced a line of bicycles called "Fat Chance." There Augspurger picked up additional knowledge and skills in bike design and construction. He became an expert mountain biker and won third place in national bicycle trials in Reno, NV, in 1985. Another important event that year was his marriage to Leni Fried, an artist he had met when he moved to Boston. Trained at the Art Students' League and Pratt Institute in New York, she was a printmaker who also was an avid mountain biker and bike commuter. When a friend at Fat City Cycles asked her to help paint his bicycle, she extended her creative work to include custom painting of bicycle frames. By 1987, Augspurger was ready to start his own company. With his wife and two partners—Gary Helfrich, whom he met at Fat City Cycles; and Gwyndaf Jones, a friend from Hampshire College—he founded Merlin Metalworks, Inc. Located in Somerville, MA, Merlin Metalworks quickly gained a reputation as the first manufacturer of titanium bicycle frames and racing wheelchairs. Leni Fried was responsible for metal finishing, including anodizing, an electrical process of bringing out color in titanium. Titanium is a very strong, lightweight, corrosion-resistant metal that is more flexible and resilient than steel. It is an element commonly found in beach sand, but because it is difficult to extract and process, it is very expensive—about ten times the cost of steel. Titanium came into use in the aerospace industry, but its cost as well as technological limitations (it was thought to require very difficult conditions for welding) inhibited its use in other kinds of production. Helfrich, however, was convinced that he could find a way to weld titanium, and he did. Merlin Metalworks designed and fabricated titanium mountain bikes and other bicycles that caught the attention of the cycling community. Their annual production of bike frames reached nearly a thousand. In 1988, Bicycle Guide Magazine named a Merlin Metalworks model as "one of the ten most innovative bikes of the year." Later, readers of Bicycling Magazine voted Merlin the year's "most prestigious brand." You propel them by hand, using what is called a push rim. . . I always thought, coming from bicycles, what about cranks? What about gearing? The next step, I thought, was handcycles, with cranks, chains, and a derailleur. I kept having an image of this design in my head, and I thought, I want to make my own. I think I can do better than this. After two years, Augspurger left Merlin to work independently, as founder and sole proprietor of One-Off Titanium, Inc. in Florence, MA. ("One-off" is a term used in industry to refer to a prototype or a one-of-a-kind product.) At One-Off Titanium, Augspurger creates experimental and custom-designed products, usually on commission. Most of his work is related to bicycles. Among the designs he has created or adapted and built since 1989 is a fully suspended mountain bike frame in steel and titanium. Augspurger performs all stages of the work, from concept and design to machining, assembly, welding, and some finishing, by himself. Augspurger credits his wife for much of his success with One-Off Titanium. "None of this would have happened without her. I wouldn't have had the time or the guts to go it alone. She has the financial brains and runs the office." She also offers custom anodizing of titanium bicycle frames, creating patterns and designs that make the cycles works of art. At One-Off, Augspurger is free to pursue his own ideas. One that had long appealed to him was to create a different kind of sports wheelchair, one that would be more like a mountain bike than a racing cycle. A few models were already on the market: a downhill racer with four wheels but with no method of self-propulsion (it was meant to be hauled to the top of a hill by a tow truck or chair lift, so the rider could coast downhill); and three-wheeled handcycles with front-wheel drive. As part of his research and development of a better handcycle, Augspurger bought and rode the existing models, noting what he liked and didn't like about them. After ten years of generating ideas and rough sketches, he was ready to build and test his own. He first made a two-wheeler, but rejected it as being unsafe. Then, using parts from old bicycles, he made one with two wheels in front and one in back, with a chain to the back for rear-wheel drive. That configuration worked, but he experimented for a while with the position of the rider. The other models he had seen all had the rider in a sitting position with legs stretched out in front. But paraplegic riders can't use their legs to shift their body weight to ease the impact of bumps in the road while they pedal the bike with their hands and arms. As a mountain biker, Augspurger wanted to make a handcycle that would offer wheelchair athletes the best performance over rough terrain. The biggest problem was figuring out a way for the cyclist to crank with the arms and steer at the same time. 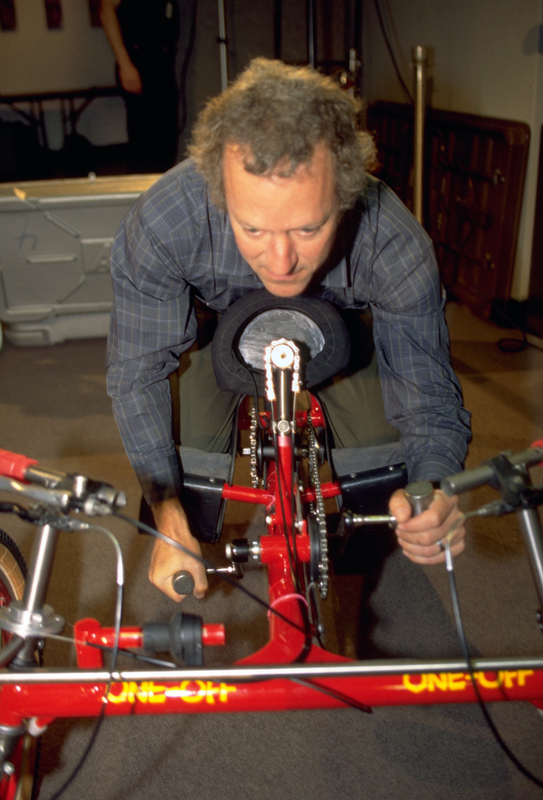 Mike Auspurger demonstrates how to handpedle his handcycle during an Innovative Lives presentation at the Lemelson Center in 2002. Photo courtesy of the Smithsonian. Finally, Augspurger came up with an innovative design: the rider's legs are folded back and strapped into supports, and the upper body leans forward, with arms extended down to reach the hand cranks and the chest resting on a pad, almost in a prone position. There are handlebars in front that can be used for steering when the cycle is going downhill; on uphill or flat terrain, when arms must be used for cranking, the sternum pad, which pivots and is connected by cables to the steering mechanism, can be turned left or right by moving the chest. Brakes and gear shifts are located on the handlebars. The near-prone position of the rider allows body weight to be used more effectively, "When you come to a bump, you can take your weight on your arms, pull up on the front, or move from side to side" to offset the impact, says Augspurger. The hand cranks, which are connected to the gears and chain, are mounted so that when the rider pushes down with one arm, the other can pull up, maximizing the rider's muscle power. And the combination of handlebar and sternum steering solves the dilemma of cranking versus steering. The main frame of the One-Off All-Terrain Handcycle is made of painted steel, for strength, while most other parts are titanium. Throughout the long process of design and development, Augspurger asked wheelchair athletes to test ride his models. They were eager to help. Augspurger wondered, for instance, whether someone who is partially paralyzed could readily move his or her hands from the cranks to the handlebars and back again. Terry Ball, a multifaceted paraplegic athlete, demonstrated that it is possible. Working with disabled athletes has made Augspurger aware of the uniqueness of each person's needs and abilities, and his customized construction allows him to adapt the handcycle for each individual. Although custom building with titanium makes his cycles expensive, he is not interested in large-scale production. He would prefer to keep experimenting and designing new kinds of cycles and other products. He has filled requests for titanium fireplace sets, blender blades, kitchen utensils, even a sword—and his biggest seller is titanium wedding rings! People learn of his work through bicycle magazines, word of mouth, a videotape he has distributed, and his website, One-Off Titanium, Inc. Recently, someone found him through the Internet and commissioned a four-wheeled version of the One-Off All-Terrain Handcycle for climbing Mt. Rainier in Washington State. Mt. Rainier, a 14,410-foot-high volcanic peak, is the tallest mountain in the Cascade range. With a steep slope and icy surface, it is a grueling climb for even the most able-bodied and experienced climbers, and is often used in training for ascents on Mt. Everest. Describing this new challenge, Augspurger says, "The tires are going to have to be made with aluminum spikes and paddles to dig into the ice and snow, and the gearing is going to have to be even lower than it is. . . . So there's a lot of research to be done, and I hope I can just keep making more and more different kinds. . . It's going to be fun!"